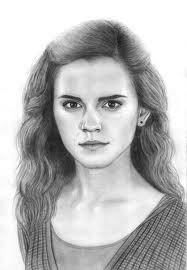 Drawings of Hermione Granger. I didn't draw this....but isn't it cool?. Wallpaper and background images in the harry potter club tagged: harry potter characters actors harry potter movie fan art. This harry potter photo contains retrato, headshot, close up, and closeup.